Bishop Backers Winter Community Day 2019 will be held Feb. 16 at Ohio Wesleyan University. 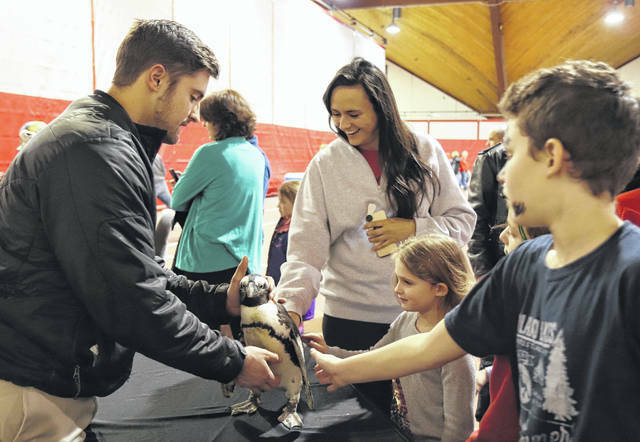 The free event will feature an OWU basketball doubleheader, and a Delaware Expo with a YMCA children’s play area and a visit from Columbus Zoo animals. Last year’s expo included a visit from penguin. The Bishop Backers invite the public to save the date for Winter Community Day 2019, a countywide celebration of Delaware that includes free admission to an Ohio Wesleyan University men’s and women’s basketball doubleheader and a Delaware Expo that showcases local nonprofit organizations and businesses. Winter Community Day 2019 will be held Saturday, Feb. 16, at Ohio Wesleyan’s Branch Rickey Arena and Gordon Field House, 105 S. Sandusky St., Delaware. Those wishing to have a table at the Delaware Expo are asked to register online now at www.owu.edu/BishopBackers. Registration is free for nonprofit organizations. For-profit businesses are asked to contribute a minimum $10 gift card to be used for event raffles. The registration deadline is Feb. 4. During the annual Bishop Backers event, both the OWU men’s and women’s basketball teams will take on the Big Red from Denison University, with the women’s game tipping off at 1 p.m. and the men’s game following at 3 p.m. Admission to the doubleheader is free with a canned food or monetary donation that will benefit the Delaware County Hunger Alliance, a United Way of Delaware County initiative. The Delaware Expo will be open from noon to 3:30 p.m. Feb. 16 and will include giveaways for the first 100 people through the door. It also will feature an indoor children’s play area courtesy of the Delaware Community Center YMCA, a visit from Columbus Zoo animals at 2:15 p.m., a chance to meet OWU athletes, and free raffles for prizes including a big-screen television. Community Day is intended to bring people together for a free afternoon of entertainment and education, building on the strong sense of cooperation and collaboration that makes Delaware such a great community. The expo also will help businesses and nonprofit organizations to connect with potential customers and volunteers, including Ohio Wesleyan students and alumni. Patricia Ryan, assistant women’s lacrosse coach at Ohio Wesleyan University, has been named interim head coach for the 2019 season, it was announced by Ohio Wesleyan athletics director Doug Zipp. “Patricia’s leadership, initiative, and passion for the program and for our student-athletes will push our program forward for this season,” Zipp said. Ryan is in her second season at Ohio Wesleyan. She served as assistant coach for the Battling Bishops last season. Ryan is a 2016 Ohio Wesleyan graduate and a native of Upper Arlington. The Battling Bishops are scheduled to open the 2019 season on Tues., Feb. 26, at Heidelberg. The Bishops’ home opener is scheduled for Wed., March 6, against Marietta. Ohio Wesleyan will conduct a search for a full-time head coach this summer, Zipp said.